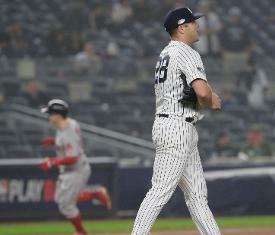 NEW YORK - Yankees catcher Austin Romine made his first career pitching appearance on Monday night, albeit under dubious circumstances, coming in with the Yankees already down 14-1 in the ninth inning of Game 3 of an American League Division Series that was tied at one game apiece. "I found out in the eighth," Romine said after the game. "(Bench coach Josh) Bard came down and asked if I could throw, and I said I'd sure as hell try. Not much to it. It was kind of quick, but I threw a couple underneath, and I went out there trying to get guys out without giving up runs." Romine hadn't pitched since high school, and this was the first time he was even approached to do so as a pro. What it led to was him being the first Yankees position player to pitch since Brendan Ryan did so against Houston on Aug. 25, 2015, and it made him just the second position player MLB-wide to pitch in the postseason, following Cliff Pennington's appearance for Toronto in Game 4 of the 2015 ALCS. "It just got to that point. You know, obviously, you hate doing something like that," manager Aaron Boone said, "but we just felt like we didn't want to use the guys we had left, knowing that we're going to want them all potentially up to a couple innings tomorrow if we need it. So that's what went into that." "I didn't envision myself getting in these playoffs in that role, but I'm here to try to help the guys out there," Romine added. "I'll do whatever I can to help the team." With the Yankees already at a 12-run deficit, there wasn't much strategy to the session, and he only needed one sign from catcher Gary Sanchez. "Uh, just a one, throw the ball hard," Romine said. "I was just trying to get it over the plate, just throwing fastballs - some slower and some harder. I'd have liked to have had fun with it, but I was just trying to eat that inning up and save our guys that were left in the bullpen." Romine wasn't worried about injury, citing his daily throwing regimen as a catcher, and again deflected any personal satisfaction back to the fact the Yankees even got to a point where he had to pitch. "It was just go out there and try to get through the inning," Romine said. "The big story is that we didn't get done what we had to get done; we came out here to win and that didn't happen, and unfortunately, I had to pitch in that game." It wasn't fun - perhaps someday, he noted, he'll look back at this as such, but in the moment it was about getting through the ninth - but he was at least able to have a little levity when asked about a possible curveball, and told how his velocity ranged anywhere from the 60 to 90 miles per hour. "Gotta change speeds or they're gonna hit it out," he deadpanned. "Just trying to throw strikes is hard enough, especially with that lineup. It seemed like the balls were coming out harder than I threw them."